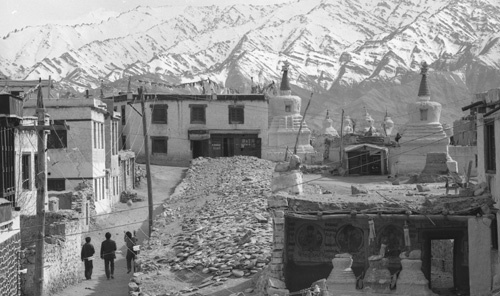 This is Leh, Ladakh, I was lucky enough to get there in 1982, I recommend it if you can possibly get there. In this picture the Indus valley is behind the stupas at the back and the mountains are on the far side. Zanskar is over the mountains. Things I make can be broken down into a number of categories, custom hats, custom shirts, bags, belts and purses, eventually you will find all of these on this site. I have another website which I have been running for some years, I am in the process of merging that site into one, this one, you can see it at my original website. I contains a lot of my travel photography and other things I have been involved with over the years. I also have a youtube channel which is mostly shorts done on the allotments, but also some short local bus journeys showing the changing nature of London.